By now, you probably know that humans are really screwing up the ocean. Climate change aside, we often dump oil into it, ruining the lives of whatever animals live nearby. Just imagine if someone drilled for oil right in the center of your house and then accidentally got the toxic black sludge all over your bedroom, bathroom, car, and all of your food. Thankfully, scientists are trying to help the animals their human counterparts are sickening. But how are we even supposed to tell if oil has sickened dolphins? One team of American researchers has turned to a method we use on humans, too, but that looks really silly in cetaceans: breathalyzing them. The researchers first discussed breathalyzing dolphins a few years ago, but now they’re actually putting the method to the test. They’re most interested in seeing how the catastrophic 2010 Deepwater Horizon oil spill has impacted bottlenose dolphins in the Gulf of Mexico. Breathalyzing dolphins requires netting them, transferring them to a research boat, and then placing the breathalyzing device carefully over the dolphin’s blowhole. 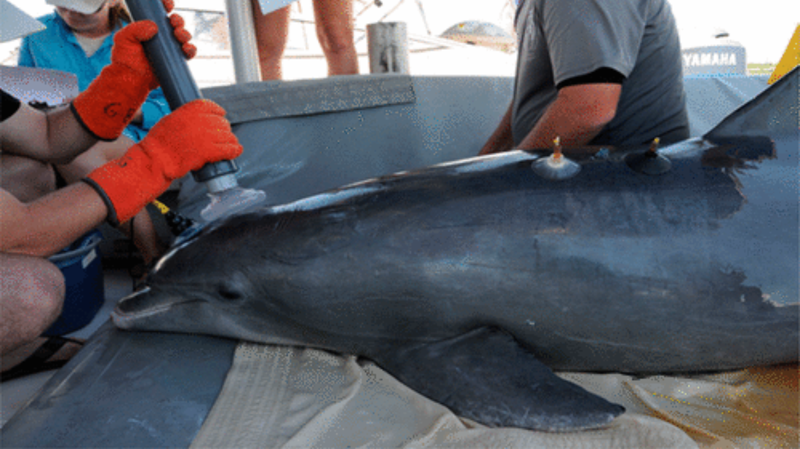 As described in a study recently published in the journal Environmental Science and Technology, the team captured and analyzed breath samples from a small group of dolphins from Barataria Bay, an area of the Gulf of Mexico near Louisiana affected by the oil spill. They compared the dolphins’ breath to unaffected wild dolphins in Sarasota Bay, and a managed dolphin population in San Diego, testing each batch of breath for chemicals that might signal inflammation. They also gathered information about various other health metrics—and no, the dolphins’ blood alcohol content wasn’t one of them. So, what did they find? The researchers didn’t want to jump to conclusions, since they had a small sample and were just measuring levels of different chemicals. But the Barataria Bay dolphins definitely showed signs of respiratory problems that could have come from swimming around in oil. That shouldn’t be surprising—past research studying live and dead dolphins exposed to oil has demonstrated lung and reproductive problems. But most importantly, the scientists felt that they did what they set out to do. They showed that breathalyzing dolphins is a reasonable way to tell how healthy they are. So if you’re a drunk dolphin, just know that we have the technology to keep you from driving under the influence. But more importantly, humans, stop spilling oil into the damn ocean. Are Humpback Whales Plotting to Take Over the World?